It is probably one of the hottest Sunday afternoons of the summer in San Diego, but nobody seems to care at this moment in time on the rooftop of the Hard Rock Hotel. HRH&apos;s Intervention is going hard, and bursting with carefree beats, releasing any tension that reality could possibly impose on the week to follow. Drinks are spilling, eye-candy is everywhere, and confetti from the stage where Tritonal is delivering an original track has completely consumed the crowd. Chad Cisneros and Dave Reed are a DJ/Producer Duo straight out of America&apos;s backyard- and they are blowing the Dance Music Industry out of the water. 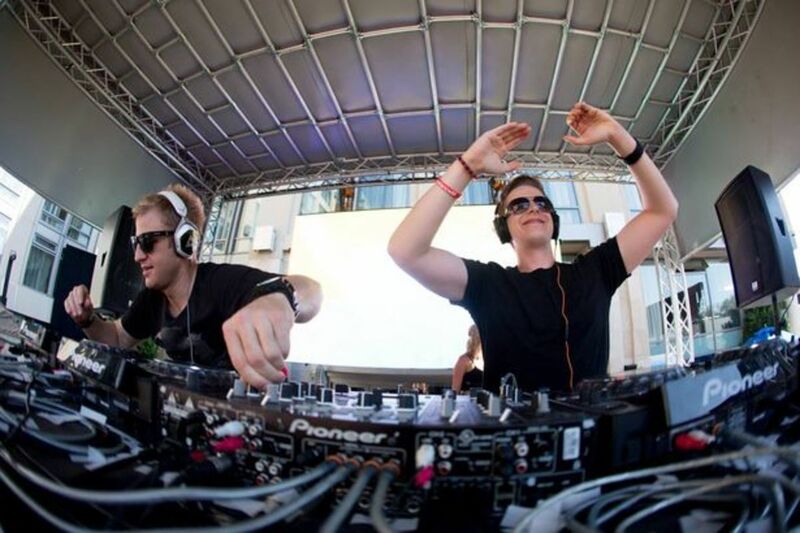 Magnetic caught up with Tritonal after their set for the low-down on the past, present, and future of the world of Tritonia. What a wild performance! There was so much diversity delivered up there, where do you pull ideas for your live sets from? CHAD: Well, we have a weekly radio show, "Tritona" and we use it as a filter for what we decide to play live. Tritonal forces us to search for new tracks, promo-pulls, and really lets us know whats going on in the industry. We try to keep the live show fresh and new, so the radio show really acts as a filtration system- separating what&apos;s good from what&apos;s not, and what&apos;s good from what&apos;s amazing. Sometimes it works, sometimes it doesn&apos;t.
DAVE: I would say that an even big part of the Tritona set is original Tritonal tracks, remixes and mash-ups. We try to make our sets unique in that regard, and I would say that it&apos;s going pretty well! After watching that performance, I would have to agree! So tell me how Chad from Texas and Dave from D.C became a duo- What created Tritonal? Chad and I used to be good friends back in the day, around 2007. We would just be geekin out on the forum for synthesizers and it just took off from there. CHAD: Right, we had so many similar ideas that we shared online, and when one collab became another.. we just became Tritonal. That&apos;s awesome! 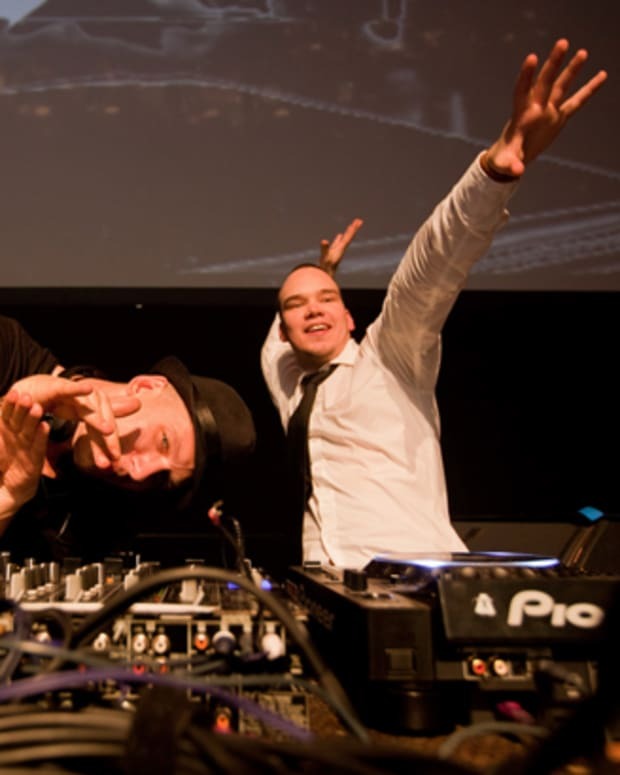 So your original collaborations as independent producers came together and ultimately became a DJ Duo concept... but how did you ultimately take the internet friendship and turn it over into a business partnership? CHAD: Dave had to make the commitment to move to Texas from D.C, it was a huge commitment, especially under the circumstances. When that finally happened, we dedicated ourselves to a work schedule, and we developed a work ethic. We worked six days a week, worked really hard. You know, although music a creative kind of thing, you can&apos;t actually get anything creative done unless you really get in there and get after it. So we really worked hard, and we&apos;ve continued to really keep that ethos- and it&apos;s led [us] to where we are today. You guys are living proof that hard work and dedication really do pay off. Tell me about the shift in your sound. Do you see any diversity in where you&apos;re currently at with your production and where you want to be in the future? How have you changed and modified your sound, and is change something that is constant for you? DAVE: Well we love to be creative. I mean, we started out with trance- like real, full on trance! And of course we want to branch out and do different things or else we&apos;d just go crazy. So now we&apos;re in the EP&apos;s and we&apos;re doing a lot of experimental sounds. We evolving and we&apos;re growing in our sound every day. and we&apos;re going to continue to move around. So yeah, we like what we&apos;re doing now-- but we may very well get bored with it in six months or a year and want to do something else. Sometimes its tricky, because you build a fan base and when you create that base, they want you to stay as you are. I think that you&apos;re right- but I also think that there is a huge percentage of your following that sticks with you to see what else you can bring to the table. You started at trance, and during your evolution as Tritonal you have managed to sync with different genres and still maintain your trance-head "Tritonians..." Would you agree? CHAD: Sure, I would say that a lot of the "progressive-house" or the "electro-house" that we play is trance influenced. 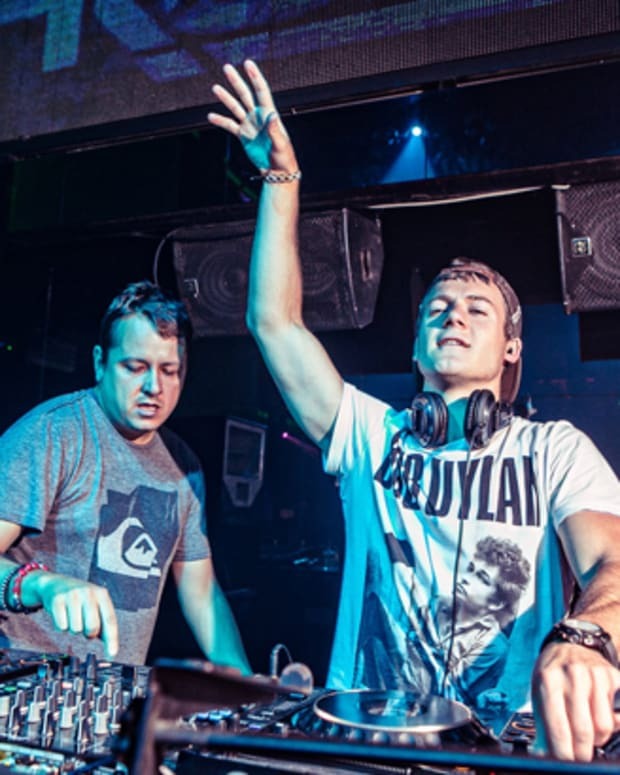 They are big melodies which is what we always loved about trance. So it really is whatever you want to call it- we like full riffs, we like big drops and we like energetic songs. But at the same time we like the chillout stuff, the really mellow tracks. It&apos;s total ear-candy, not even stuff you can play live. just to show that we have a little bit of that too. Honestly, we just like to write music. And I think that if we can keep doing that and we trust our hearts, we&apos;re just going to keep going with it! Keep following your instinct, it&apos;s obviously working in and out of the studio. Your Metamorphic tour has been Massive, sold out shows everywhere! What has been your most memorable part of Metamorphic so far? DAVE: Man, we just came raging out of Honolulu, and that was incredible. We played with Topher Jones and Krewella and it had to be 9,000 or 10,000 people. There was so much positive energy. It was so great, amazing. It was easily the biggest show of the tour so far. We definitely sold out some markets that weren&apos;t as big as Honolulu, but they were equally as special in their own regard. One of them that comes to mind was at Ruby Sky in San Francisco. Our first show there was maybe 50-100 people about four years ago. Looking back from then to now- we completely sold out Ruby Sky on a Thursday night. For us, that was a huge step. Four years is a relatively short period of time to create a following that huge. Congratulations! 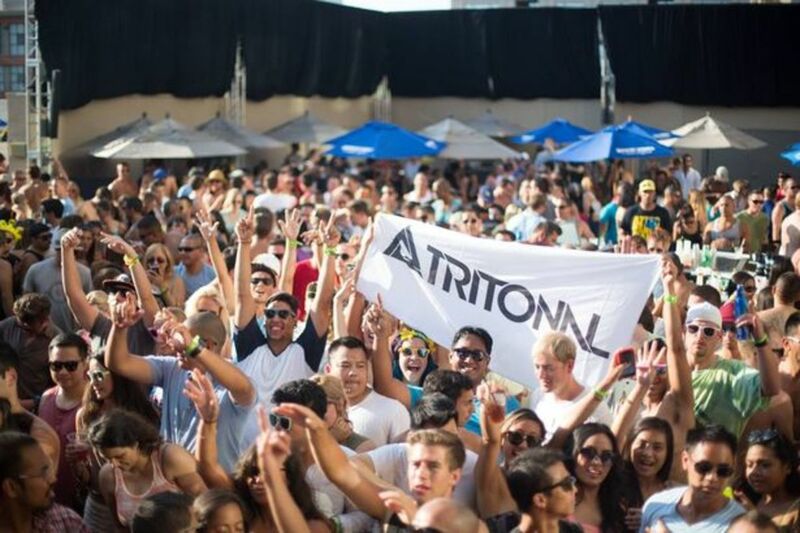 What would you say Tritonal&apos;s biggest accomplishment has been so far? I think that the album is the first. We had eight #1 singles off that album. DAVE: I think personally for Chad and I, our biggest accomplishment has been the knowledge that we&apos;ve been gaining in the studio. We have learned so much, and we&apos;ve created some great tracks that aren&apos;t even finished, but are hands down, by far the best vocal tracks we&apos;ve done. They&apos;re on a different level. CHAD: Seriously, we&apos;ve never gotten anywhere close to what we&apos;ve been doing and we&apos;re totally freaking out about it. We feel like 2014 is going to be the big game changer from who we are now to who we want to be. That&apos;s a heavy drive, I definitely admire your ambition. With all of this personal success, have you entertained the idea of getting back into the studio full-time and producing another full-length album? CHAD: You know, some of the newer Tritonal fans may or may not know but we just came off from creating a huge album. Piercing the Quiet was a two year project- it was a huge thing. We produced the whole album, and then went in and remixed 8 or 9 tracks, which created a whole new album- Piercing the Quiet: Remixes. So really we&apos;ve really done 2 albums. So I guess right now with the Metamorphic tour and the Metamorphic EP&apos;s - we&apos;re not done, we&apos;re just kind of &apos;Albumed-Out&apos;. It&apos;s album break time! It&apos;s time for us to change it up. DAVE: We don&apos;t want to just be the guys that are like "Oh here, another album and another album." We want to change things up, so we came up with a concept that tells a story with music and still keeps us fresh- that was the idea behind the EP&apos;s. With three tracks, you can tell a little story, yet you don&apos;t have to release an entire album. It really allows you to keep fresh on the material you&apos;re working on and think it out thoroughly. Awesome. When you do decide to get back into the studio, or even while you&apos;re traveling- are you guys looking to do any further collaborations? Tritonal is just focused on Tritonal right now. It&apos;s not to say that we wouldn&apos;t consider it, artists that come to mind that are killin it right now are W&W, Hardwell, Alesso and such- but we&apos;re not knocking on their door asking them to collaborate with us, or anything like that. We&apos;re just really focusing on being Tritonal. We&apos;re letting the chips fall where they may. Your artistic direction is on point, especially with the prominent evolution of the dance music industry. The explosion of EDM has really grown in the last few years and you&apos;re right up there with the peak of it. What are your personal and artistic takes on the heightening popularity of EDM Culture? And honestly as musicians- we got into this because we wanted everyone to hear it, I didn&apos;t write music for only 12 people to hear it, and for it to live completely underground its entire life. When I got into writing music, I wanted to write great music so that a lot of people could hear it. I think that this is a huge dream that not very many people get to experience, so we feel very blessed to be in it, in the US right now. DAVE: It&apos;s amazing! We&apos;re living in the best country in the world- the United States of America! I think this is the best place for dance music to take over. It came from Europe and evolved here and fused with all of these commercial tracks. It&apos;s just awesome! There&apos;s so much good that comes with it, but there&apos;s negatives too. I think that obviously the market is going to get over-saturated with tracks that aren&apos;t very good and over-saturated with festivals and club nights. But that happens with anything. It happened in hip-hop, it happened in rock, and it will continue to happen. I think that with anything in life the cream rises to the top and those who are continually pushing out good tracks and working to create great records are going to make it in this world. I think that we&apos;re really beginning to feel the impact of good music here in the US! Besides writing and touring, what are you really looking forward to in this next year? DAVE: Our releases. Hands down. This is going to be a big year of releases. We&apos;ve got so many good, potential records. We used to struggle with what everyone goes though; being that we need more material and we&apos;re running out of material. Now, it&apos;s like the total opposite- we have too much material and we cant figure out what to do with it! It&apos;s a great debacle. We&apos;re changing up the radio show this year too, so maybe we will squeeze the tracks in there! Sounds like it&apos;s a really great problem to have. It seems like between your business ethic, views and personal goals- you really have a good thing going for the future. What kind of advice can you give to anyone trying to get into the dance music industry, or the music industry all together? Singers, songwriters, producers, the whole cluster? CHAD: Well, it&apos;s really hard now. It all boils down to staying determined. It can get frustrating and overwhelming with all of the good material that&apos;s out there, but there&apos;s a lot of bad material out there too. I would say the best piece of advice you can give to any DJ, is to not worry about DJing. Don&apos;t spend your time running around the city trying to get around with all the local politics of spinning. Spend your time learning how to write good music. If that&apos;s all you focus us, even if you never make it- you will have something so much richer and greater in your life. And that&apos;s the ability to write good music. That&apos;s so much more than making standard club contacts. If you make good music, you will get big gigs. worry about how good it is. If it&apos;s good on the radio, it&apos;s good on the iPod, its good at the festival, then it&apos;s all good! Make mistakes, and learn! Great advice! Final question- How has your career impacted your personal life? CHAD: Wow, good one. Well, I don&apos;t drink or party on the road or anything like that. So when I get home I just want to be at home. The normal stuff. It&apos;s not like we get home and go out to &apos;see the local talent.&apos; I want to just be home. I try to work out, eat healthy and spend time with my family. DAVE: We&apos;re touring so much right now that sometimes it takes forever to get a track out too. When we get home I think that we just really try to be normal. Like, overly normal almost. Grocery shopping, dogs, movies- blankets and pillows. That&apos;s what it&apos;s all about. Blankets and Pillows. We have to thank Tritonal for taking time out of their schedule and giving us some artistic insight to their crazy life! Chad and Dave are truly two very down to earth, enlightening and entertaining guys. Keep the focus, your Tritonians eagerly anticipate the future releases!